Micron (NASDAQ:MU) still hasn’t broken through its June highs despite rallying back after Brexit and its recent earnings. Now may not be the time to invest in Micron as I’m expecting the market to correct over the next few weeks before moving up once more. Micron is a volatile stock operating in a volatile industry. Therefore if the market corrects, expect Micron’s losses to be more than the S&P500 (NYSE:SPY) for example..
Micron definitely has near term tailwinds in its favor such as 3D Nand and its 20nm Dram node but price has to play along. This is the one element that Micron cannot control – market pricing. To get back into profit and to negate this risk, the company has announced a restructuring plan which will cut costs and pour more resources into Nand. 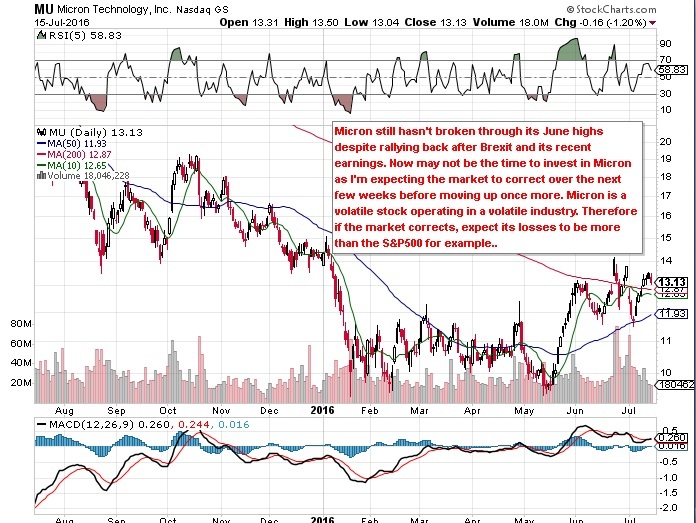 Micron is a stock that could easily double in 12 months but could also drop below $10 once more. Watch inventory levels and invest with caution.. This entry was posted in Trading and tagged mu. Bookmark the permalink.